Lymphoid follicle. 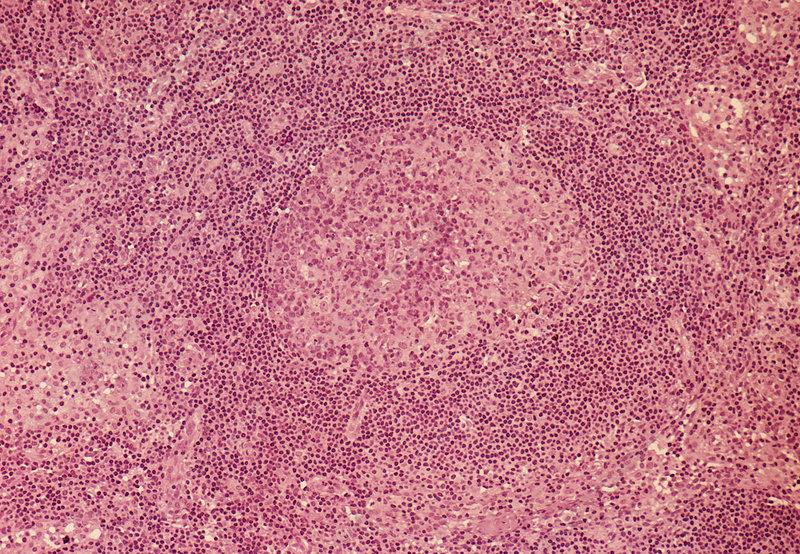 Light micrograph of a section through a lymphoid follicle in a human lymph node. The follicle is rich in immune system cells (lymphocytes) called B-cells. Each B-cell responds to a different foreign molecule (antigen). Specialised cells (follicular dendritic cells) present antigens to the B-cells. When a B-cell is exposed to its antigen, it begins to divide in the germinal centre (pale, centre). B-cells produce antibodies which protect the body against disease organisms. Tissue fluid (lymph) drains through lymph nodes on its way through the system of lymphatic vessels. Magnification: x40 at 35mm size.